Services Offered at Mid-Michigan, Ear, Nose, and Throat, P.C. Suffering from otitis Media? Let one of our physicians perform a physical examination of your ear (above) and treat accordingly. 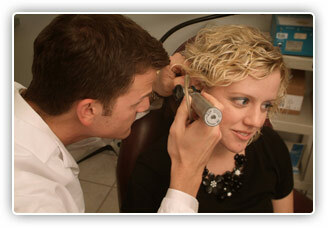 We specialize in advanced hearing aid technology, our audiologists offer a full range of solutions for hearing loss. Need help with allergies? Let our physicians assist you with your allergy symptoms. We will test and treat accordingly for prompt relief. Mid-Michigan Ear, Nose & Throat P.C. is the areas leading ENT practice of six board certified otolayrngologists. With six certified Aduiologists as well.